Think of a mouth full of creamy and savory polenta deliciousness with a wisp of its grilled crunchy surround. Top it with a tart, juicy, sweet layer of fruity wine pickled onion, and add the rich pungent fullness of ripe gorgonzola cheese crumbles, and grassy aromatic fresh herbs. This beautiful and delectable “Crostini”, Italian for “little crust”, my rendition made with polenta, is enigmatic of traditional Northern Italian Cuisine, morphed by international fusion. It is perfect for any size party because of its wow factor and ease of assembly. Currently, polenta is known as a corn based recipe, though originally it was made from aggregate grains and legumes mixed with various flavorings of vegetables, meats, herbs and spices. The beauty of its contrivance is that it can be as simple and easy or as complex as you choose it to be. What counts is flavor and eye appeal. You can start from scratch, buy a quick cook variety, or buy a tube of pre-made polenta. Which ever you choose, follow package directions and add some of your own imagination and flavor. Slice and grill the chilled firm polenta as a platform for countless accouterments. Build your own creation from there. 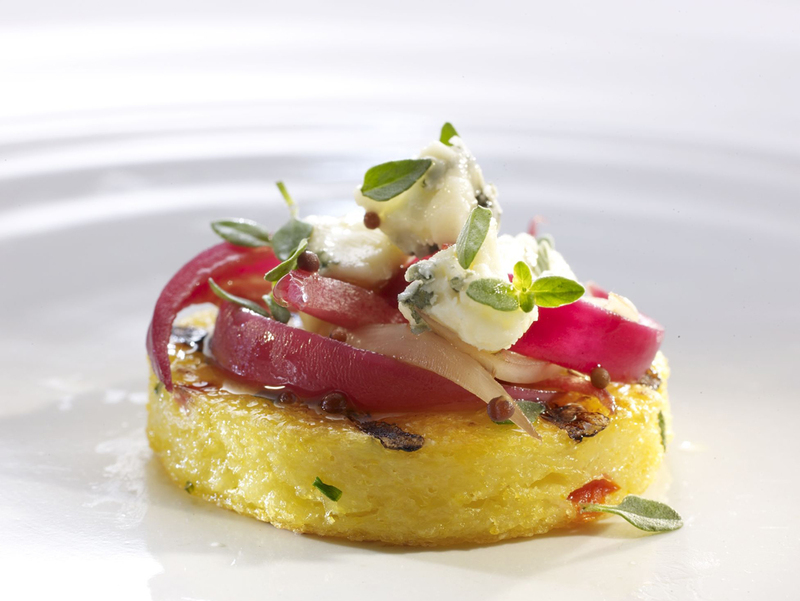 Keeping in mind that the basic proportion for cooking polenta from scratch is three parts water or broth to one part corn flour, here is my rendition of a fun, beautiful and delicious grilled or pan fried polenta appetizer. in a 3-4 quart pot, saute vegetables in half of the olive oil on medium low heat until soft, reserving chopped herbs. Add water to the pot, turning up the heat to bring it to a boil. Add the corn flour slowly while stirring until the mixture amalgamates and thickens, lowering heat as needed to avoid sticking, about 20-30 minutes. Stir chopped herbs into the mix quickly. Pour onto a greased 1/2 sheet or jelly-roll pan and smooth with an off set spatula to even out the thickness. Let cool until very firm, about one hour. You can speed the process in the refrigerator. Cover with waxed paper and turn out onto a cutting board rapping on the bottom of the pan sharply. Cut into desired size and shapes with a knife or cookie/ biscuit cutter. Grill in a well oiled pan, or under or over a flame until golden brown and crusty. Julienne onions into points by cutting them in half length wise, peel off skin and tough outer layers, then continue slicing them end to end into crescents with the widest center measure at about 1/4 inch. Separately, in two one quart sauce pans, bring all ingredients of red and white pickling elements, except the onions, to a boil stirring to homogenize the flavors. Add the onions to their respective pickles, and continue to boil, reducing the heat slightly to slow evaporation, until they absorb color and flavor but are still slightly crunchy, 5-10 minutes. Drain, reserving liquid for another time. Cool separately on two trays to keep colors from touching each other, single layer in the refrigerator. Cover with plastic wrap, once cooled. Keep refrigerated until use. Store leftover pickled onions in sealed jars with a small amount of their liquid. They are delicious added to many dishes. Building the appetizers are pretty self explanatory using the photo image as reference. Using your innate intuitive sense, somewhat alternate the white and red pickled onions a top the crostini rounds in a circular spiraling swirl. Top each round with a proportionate amount of Gorgonzola crumbles and garnish with small herbal leaves or sprigs. This elegant, delectable & delightful breakfast, brunch or dinner entree is as soothing and delicious, if not as seductive, as it’s French predecessor. I was inspired by a recipe from our beloved Jacques Pepin, and changed it up a bit so that we can see all of the ingredients in a wider scope, then added more flavor and visual ingredients. 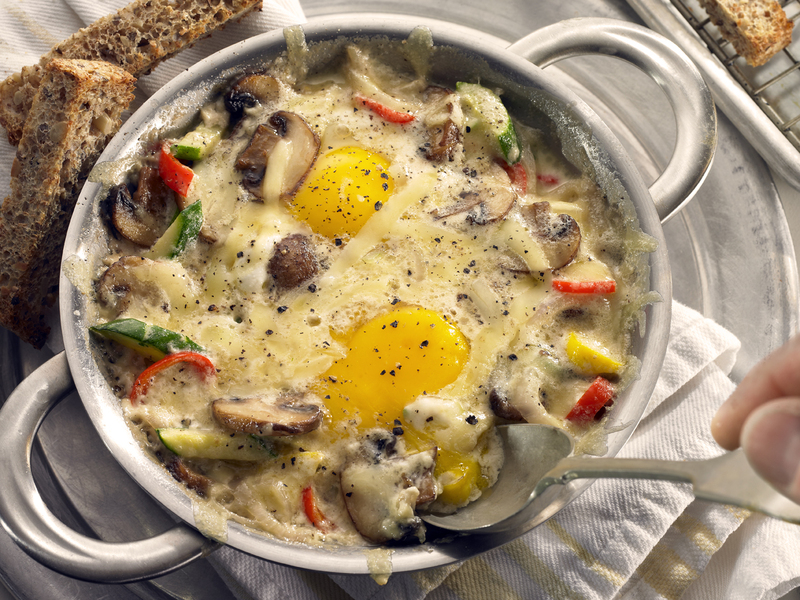 The definition of Cocotte is an egg cooked individually in cream or butter in a small ramekin. I used six inch stainless steel double handled personal braising pans because of the presentation possibilities. As a food stylist I gravitate toward palettes that can showcase the food in it’s entirety. The traditional Cocotte obscures most of the ingredients because they are on top of each other, like a parfait with opaque sides. I used 2 medium eggs instead of one large egg for symmetry and added various baby vegetables for; balanced scale and textural mouth appeal, color for eye popping lasciviousness, and flavor for the soul to savor and devour. The end product is enticingly simple, easy and fast, while being lusciously delicious. Heat pan on medium low heat with olive oil for a moment until it is just hot. Add shallot, squash, peppers and some seasoning. Cook until tender, about two minutes. Turn up the heat a tiny bit and add mushrooms, cooking them until they release their water and begin to brown a bit. Stir the mixture. Add cream and cognac, stirring the mixture again and tasting for balance. Add more seasoning if necessary. Simmer for a moment to thicken a little. It will thicken more in the next step. Make two welts in the mixture for the eggs. Crack the eggs into the welts and lower the heat a tiny bit. Garnish the cheese onto the eggs and veges. Let them braise in the liquid until they are cooked to your desired doneness of yolk, making sure that the whites are not still mucus like. You may have to spoon some of the liquid over the whites to ensure even cooking, without over cooking the yolks. Serve hot with the side of toast sticks for dipping. Add the beverage of your choice, depending on the corresponding meal…Orange juice, Green tea, Prosecco… whatever your heart desires.